Moving users from one physical location to another…Moving users off Enterprise Vault as part of enterprise reorganization. These scenarios create the unique challenge of restoring messages to user mailboxes from Enterprise Vault. A “restore” feature is built into Enterprise Vault—it moves all archived items back into the user’s mailbox. The unintended result could mean restoring messages with broken shortcuts or placing unwanted items back in the mailbox. This is even more problematic for Enterprise Vault versions prior to 8.0 – where built-in restore doesn’t account for moved shortcuts post-archive. This could mean data being restored to the wrong folder. 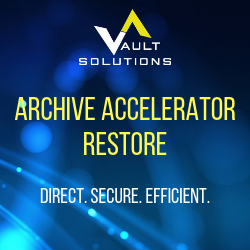 Our Archive Accelerator Restore reintroduces items into a user’s mailbox based on existing shortcuts – resulting in a cleaner restore with no duplicates. Our product offers an “Unattended” mode to restore multiple mailboxes automatically. With Archive Accelerator Restore, the process of restoring messages just got one step easier! The solution for migrating to the Microsoft Exchange Online Archiving feature – with the ability to restore messages either before or after mailbox migration. Running during off hours, around the clock, or anytime you choose via its scheduler. With AA Restore, regardless of the size of your business or how many mailboxes you are looking to restore, you can take advantage of other standard features that make restoring secure and efficient. All restore processes are managed by the administrator via a Management Console – in a multi-threaded manner with the ability to schedule during off-hours. Migrate directly from Enterprise Vault to Google Apps for Business with Restore.